What Kind of Tooth is a Mesiodens? The tooth erupting on the palate is a mesiodens. It is quite large and visible compared to some. What kind of tooth is a mesiodens? I will tell you and show you one! A mesiodens is an extra tooth, also called a supernumerary tooth, that occurs in the middle of the mouth. The typical location is between the upper front teeth. It may occur between the central incisors, in front of them or behind them. These teeth are almost always recommended to be extracted due to their position in the mouth. Mesiodens are usually picked up or ‘discovered’ with a dental x-ray. 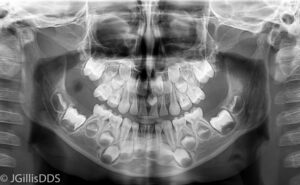 In our patient, the mesiodens was first noted on a panoramic x-ray which shows the teeth from ear to ear. The tooth later erupted into his mouth on the palate behind the front teeth. Although the tooth wasn’t really bothering him, it did bother his mother and it was visible in his mouth. He was about to begin orthodontic treatment and for these reasons, we recommended that the mesiodens be extracted. 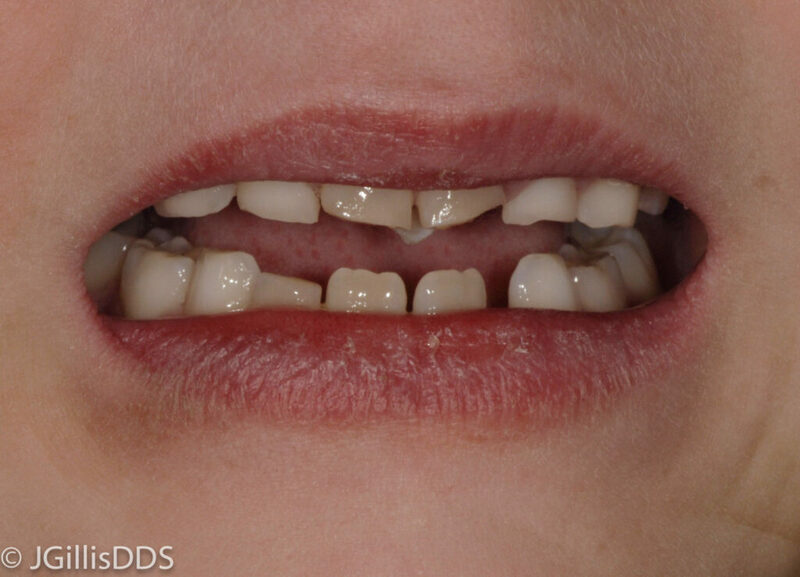 In this photo the Mesiodens is seen between the front teeth on a 7 year old patient. What Kind of Tooth is a Mesiodens? 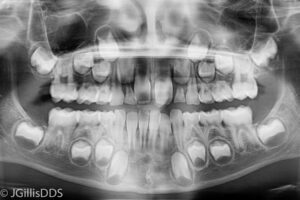 The Mesiodens is harder to see here behind the upper front teeth on our patient who is about 6 in this photo. The procedure is done most comfortably in an office where the patient can sleep through the procedure but most dentists are comfortable completing this extraction under local anesthetic. Mesiodens teeth are usually discovered at a young age when the patient may not be as comfortable in a dental chair. For this reason, I believe that the extraction is usually done under general anesthesia which often means seeing an oral surgeon. The Mesiodens is just visible behind the upper front teeth. Our office wants our patients to be as comfortable as possible for their dental treatment and we will always provide options for dental care. Our office is in the Grand Valley on the Western Slope of Colorado and we serve patients from Grand Junction, CO, Palisade, CO, Fruita, CO; Clifton, CO and surrounding communities. Please call our office (970) 242-3635 if you need a general or cosmetic dentist. We would love to see you! We see lots of children in our practice when their parents are also patients!